Golf group organizers and members of their golf group can rejoice now that a much needed feature was added to control the number of e-mails they receive. We have added a global preferences page which gives the option to receive or not receive e-mails under certain circumstances. For example, now golf group leaders can receive every RSVP through e-mail or opt out. Also, group members and organizer have several other options such as receiving notifications when tee times are added, when an event is locked or unlocked, and reminder e-mails before an event starts. It started with an idea. What would happen if you provide a simple, useful tool to help people organize their outings with their friends? We didn't know the answer to this beforehand, and we didn't have the time or money to do focus groups. So we just built the basic functionality to TeeTimeHelper and wanted to see what would happen. 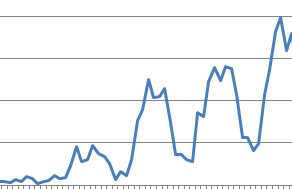 Four years later, we can chart our progress by the number of events we've helped organize. TeeTimeHelper is growing at approximately 40% each year, and appears to be accelerating. This is great news for our users because when we see a chart like this it inspires us to provide even more tools at no cost. For example, we just added a section"Upcoming Events" into every event details page so now all your events are tied together and you can easily flip between events. We also added better navigation, better visual feedback for actions on the web site, and clearer messages throughout the site. You can organize different types of events with TeeTimeHelper. In this blog post we will focus on quickly hosting a shotgun event. A golf shotgun event means everyone tees off at the same with groups starting on different holes. This allows a golf facility to fill up to the entire course at one time instead of having everyone start on the first hole with 8-12 minutes between each group. The primary benefits of the shotgun start are two-fold. First, everyone finishes around the same time so more people can participate in a lunch or activity after the event. Secondly, golf operations people like shotguns because more people can fill the golf course at one time instead of having open golf holes with no golfers. Running a shotgun event with TeeTimeHelper is similar to hosting other types of golf events, many of the fields are the same such as event date/time and venue. Simply select the maximum number of tee times for your shotgun and invite your golfers. We handle sending the e-mail invites and keeping track of who has RSVP'd. We'll even send a reminder message to your golf group the day before the event starts. If you change your mind and wish to change your event to different tee times no problem, the standard TeeTimeHelper interface can handle this quickly without removing your event. Great news for regular golfers! You can now see a summary list of all the dates and venues of your upcoming events. Just use any of the links e-mailed to you to check the status of an event and at the bottom all your upcoming events are conveniently listed. As you can see you can easily see an overview of your events. When you switch back and forth between your golf events to see who is playing, change your RSVP or add a comment. Setup your next golf outing with TeeTimeHelper.com. 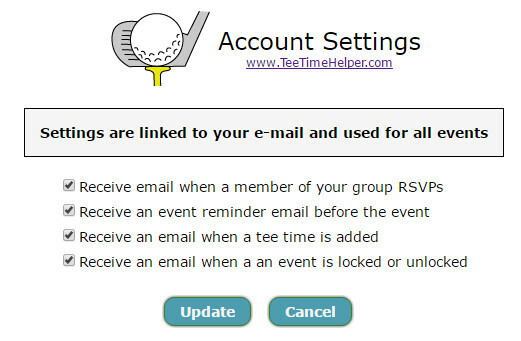 We've made TeeTimeHelper more informative and easier to use with visual confirmation messages and big, bold buttons. In the past TeeTimeHelper relied on wordy confirmation and error messages. We now use graphical elements to express what is happening with your RSVP's and event administration edits. As you can see the green buttons are larger and more distinguished. Also, when you hover the mouse over the button it will change to a different color to give you more visual feedback. Please send us your comments for further TeeTimeHelper improvements! Some of our best ideas features have come from TeeTimeHelper users.